Welcome back! I feel like the fall is really my “new years” fresh start. I guess I am still in the Back to School mode after all these years…even though none of my children are really there yet! What better way to be welcomed home then by this fabulous pink lacquered door. It pinpoints my philosophy that your foyer, and for that matter, your front door is the first thing your guests, and you, will see. So let it set the tone for the rest of your house. This one is from Kelly Wearstler and I love it! 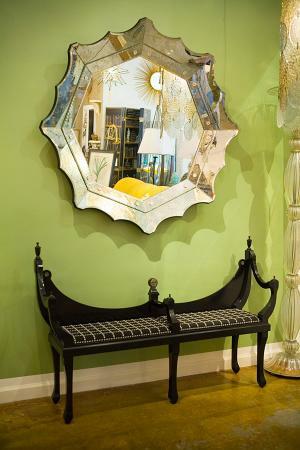 Foyers are a great place to add those unique finds that may not have a specific purpose but are just so chic. Like this, Muirfeld Bench from downtown20.net. Add some really fun fabric…maybe kelley green or hot pink…and it would be a knock out! Without too much to lure little ones or their teenage siblings into hanging out in the foyer, it is one of the “safest” places in the house to add some Wow! Happy hunting! **just a note to those that have signed up to “follow” my blog: I have added Feedburner as another option for getting updates when I post and I find it a little more user friendly, sending emails directly to you when I make a new post. So you may want to go that route!